EXERCISE ANYWHERE & ANYTIME: Portable handle exercise bike is mini and easy to move. With the handle, you can take it from the living room to study. You can keep exercising when you are watching TV or reading books. TENSION ADJUSTABLE: Resistance adjustable with the tension screw, different strength you can regulate for yourself. 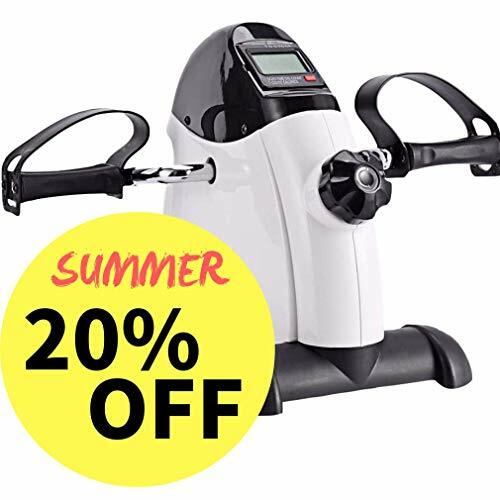 This mini trainer is suitable for arms and legs muscles strength training, increasing blood circulation, exercising joint flexibility, improving stamina and relieving tension. RECORD YOUR EXERCISE: Multifunctional LCD monitor includes the count, total-count, time, calories RPM and scan, making your exercise more reasonable and effective. NOTICE: Requires simple assembly to use, with tools in the box. WHAT YOU GET: A SYNTEAM portable pedal exerciser, a manual.